Discipline is about love. That might not be a believable statement, but it is true. Discipline is about teaching your child how to behave. It is about helping your child to control him/herself. It is about helping your child learn the correct way to act in any given situation. When we discipline, we are showing our child love. Discipline isn’t mean nor harmful. I would even argue it is necessary. This post contains affiliate links. The D word. It gets a bad wrap these days. You say the word discipline and people seem to immediately imagine beatings with a metal rod. Discipline means nothing more than “to train.” There are a lot of training methods out there–there are more variances than probably any other point in the history of humanity. Let me tell you something. 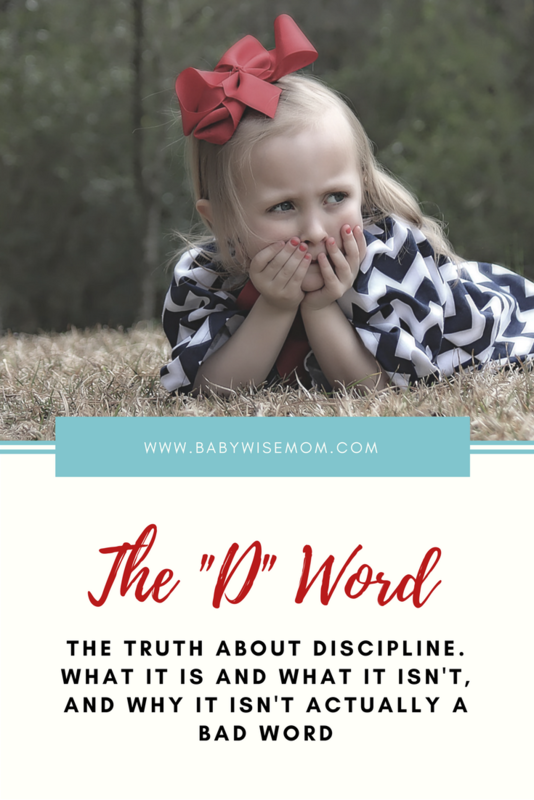 Whether you like it or not, it is your job to train your child–or in other words–to discipline your child. Even a baby needs discipline. A baby can get herself into a lot of precarious situations. A baby does not know what is safe and what is not safe. You need to teach her–train her—discipline her to know what is and is not okay. Not only is discipline your job, it expresses love to your child. In The 5 Love Languages of Children , we read, “Love looks out for the interests of another; so does discipline. so discipline is certainly an act of love. And the more a child feels loved, the easier it is to discipline that child” (page 121). I like that quote because it shows both that discipline is an act of love and that we need to show love as we provide discipline. Discipline doesn’t need to mean that we are angry–it just means we are teaching and training. So don’t be afraid of the D word. You do nothing wrong in providing discipline for your children. Semantics are of little consequence, so if the D word gets you dirty looks and angry comments, call it teaching or call it training. It doesn’t matter–the methods and end results are the same. Previous Post Poll Results: What was baby’s independent playtime length at 6-7 months old? We use the word "obey" with our daughter (a lot) and though no one has said anything to me, I often sense that it's a word that folks are uncomfortable with. Our intent is to use the word in daily living so she can best understand it in The Word. Honestly, there must be some rebellious part of me because I kind of like seeing people squirm with my Babywise references and my biblical terms. Hopefully I get them thinking because our girl is a pretty good example that it works. Lord knows we need more discipline and obedience in this world. You are welcome and thanks for your comments!